I mentioned a few weeks ago that I have been working on a version of my everydayMOM planner for kids. I decided that my boys needed a good place to keep track of their school assignments everyday, as well as anywhere they need to be. I finished the planner and my first two copies arrived in the mail today! I ordered one for each of my boys, who are 8 and 6 years old. I’ve already been busy writing in birthdays, holidays and appointments, as well as karate class, gym class, co-op and other places they will need to be this fall. They ask me every morning what day it is and what is on the agenda for the day, so I’m hoping this will help. 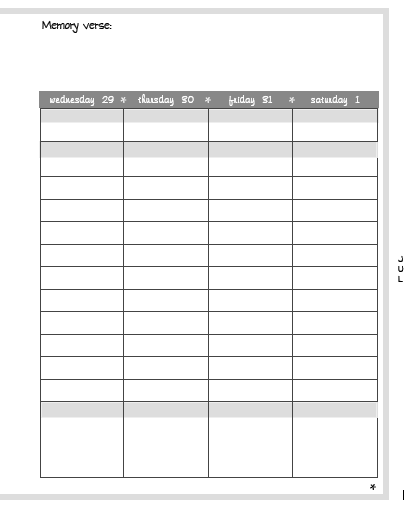 This first planner, which is sort of my test model, goes from August 2009 to December 2010. They have a spot to write down anywhere they “gotta go”. The next section is for school assignments, since we are doing school at home this year. I’m planning to use this section to let them “earn” special privileges, like watching a movie or playing Wii. The weekly layout also includes a space to write a memory verse for the week. 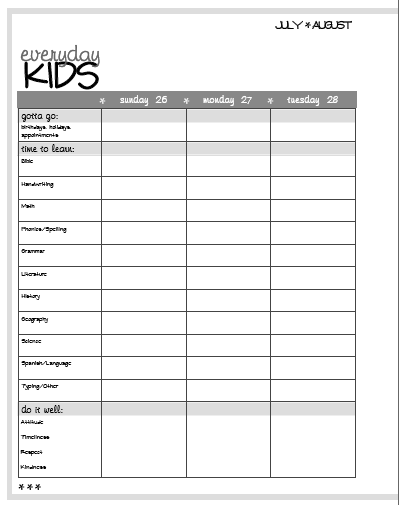 You can check out a preview of the everydayKIDS planner at my online storefront. If you want to order, let me know. I can place several orders at once to save on shipping charges. So, I’m curious. Am I the only mom on the planet who thinks her children need their own planner? If you are a home school mom, do you already have a system that you like? Do you have any feedback for me? If you aren’t a home school mom, would something like this interest you if it had different categories, such as chores and homework? Previous Post Previous post: Got game? No planner here. Just my iCal and Notes on my iPhone. Works for me! Thanks for your encouragement Laurel! Now I have to get the mom one finished! !